Zion National Park was one of my busiest stops on #TerryTreksUSA. I had a lot planned here. 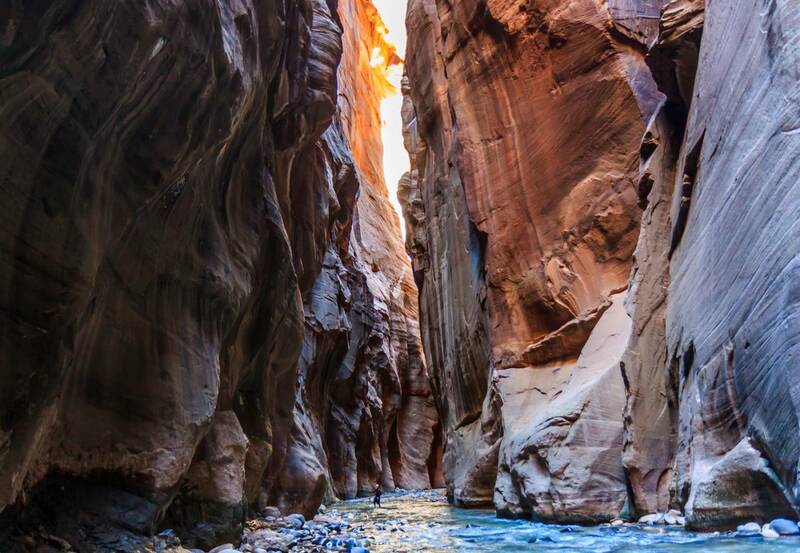 The biggest single activity was hiking the Virgin River Narrows. 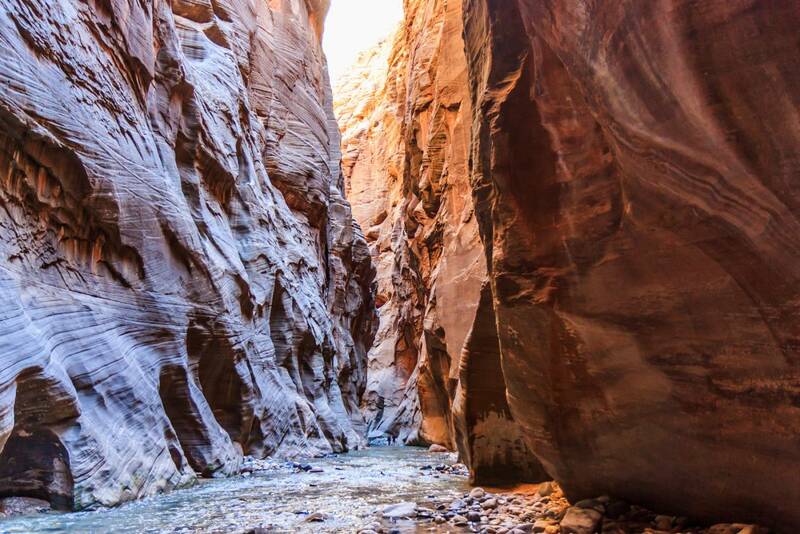 This is a hike in the river where the cliffs are so close there is no room for a trail. The river is the trail! I was nervous about this because there may be some places that require scrambling or swimming, depending on the water level. To avoid this as much as possible I decided to do the hike “bottom up,” starting from the Temple of Sinawava, and going as far as I felt comfortable. The “top down” option sounded really great, but I didn’t feel comfortable doing it alone. 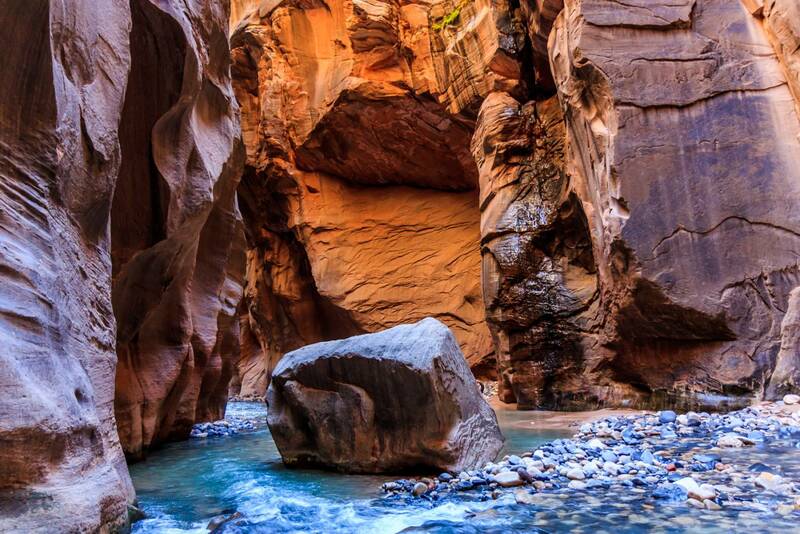 It involves starting far up the river and staying overnight in the narrows. A backcountry permit is required. My timing was poor, and I would be doing this on a busy Saturday. I took an early shuttle to the Temple of Sinawava, and there were already quite a few people gathering at the end of the short river walk trail. For many people this would be as far as they would go, but some were gearing up. At the start of the Narrows. One I finished my preparations I waded into the cold water with a small group. I would rarely be alone on this hike. The water wasn’t too deep at first, but walking in the water made the going slow. There were many sandy beaches that were easier to walk on, but erosion is a major problem here. The NPS tries to encourage people to walk in the water but many people did not get the message and trampled the beaches. Leaving early was good because, while I was never alone, there weren’t that many people on the hike out. Landscape photos with a human element in them are often more interesting, and there were just enough other hikers to only capture one or two in my shots. The light was also more dramatic early in the day, as the sun started rising over the tall canyon walls. 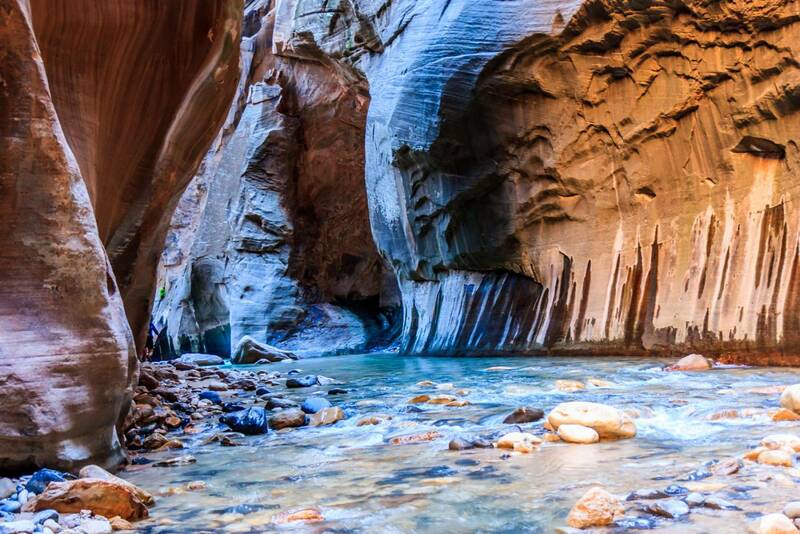 The Zion Narrows is considered one of the best hikes in North America for good reason. It was certainly the most amazing hike I’ve ever been on. The water was incredibly clear, the cliffs towered far above, and the narrow sections were quite interesting looking. I wasn’t in a hurry and stopped a lot to take pictures and talk to my fellow hikers. I even went down the Orderville side canyon a ways. Nobody else did, so I had this narrow section all to myself. My leisurely walk out took three hours. My goal was to reach Big Spring, but just short of that it got really deep. None of us wanted to swim or scramble over the big rock in the river, so we all turned back. This was a good place for my lunch break. As I ate, some hard-core hikers in full wetsuits came down the river. It’s possible to get all the way through if you know what you’re doing! The walk back was different. It was after noon now, and the crowds were coming. I couldn’t believe the hordes of people. As I carefully stepped through the river I had do avoid the masses coming towards me. And I was getting tired from having to watch my steps in the water. I was glad when I made it out. I decided to invest in renting the special river boots, neoprene socks, waterproof pants, walking stick, and a waterproof camera bag. None of this was really necessary, but the water was cold, so it was nice to keep my legs dry, which were often submerged. The socks don’t keep your feet dry, but they do keep them warm. Plenty of people didn’t have any of this, and did just fine. Some people used regular walking poles instead of wooden walking sticks. As for the camera bag, It was nice to protect my expensive camera from a potential catastrophic submersion, but I never needed it. In the deep parts I was able to lift it above the water, and I never felt as if I was going to fall in the water. The cliffs tower above the river. 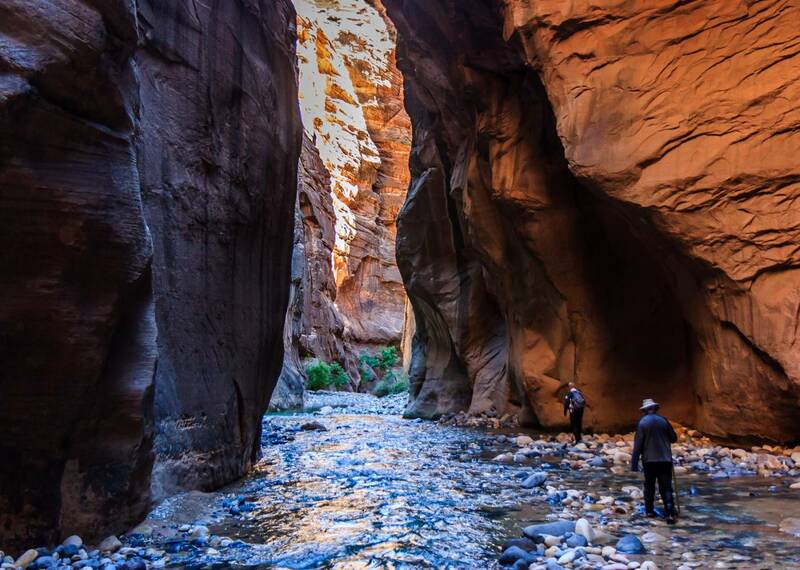 The Zion Narrows is worth a full day doing the bottom-up hike, or if you have time, a two day top-down hike. Hiking top-down has the advantage of no crowds, but the number of people on the bottom-up hike can be minimized by starting as early as possible. This was a highlight of #TerryTrekUSA! 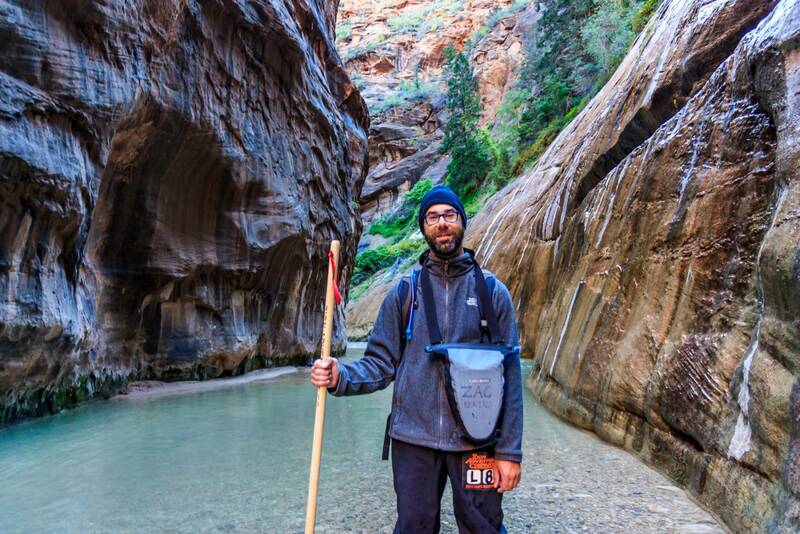 I was never alone in the Narrows. This rock was the end of the line for most of us. I want more, I want more! I bet you are having a fun time hard to blnaace all of the photography editing and writing with traveling right?! 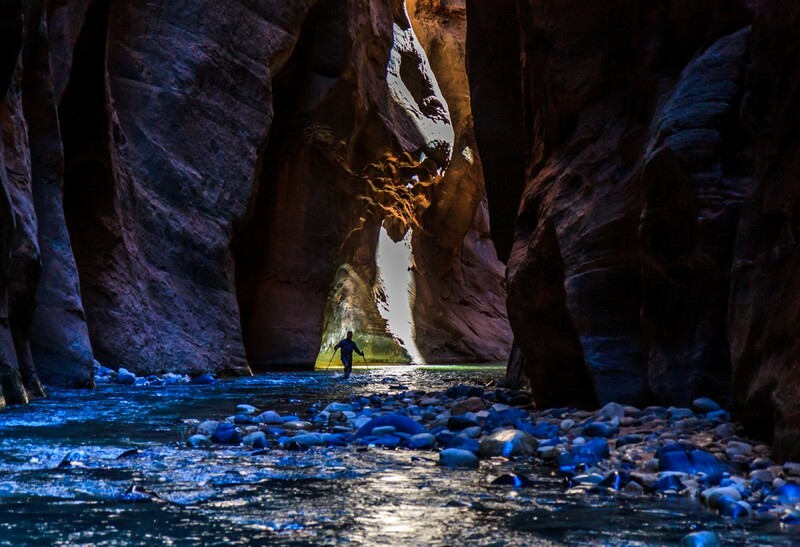 So strange but one of my friends and I are now considering doing a week in this area so I’m really excited about your Narrows photos since he is intimidated by it. I need to prove to him that it’s not as hard and scary as he thinks at least I hope it’s not!